Colds result in direct and indirect costs of about $60 billion annually in the U.S.
(CNN) -- Researchers have solved the first step in treating the common cold, by mapping its entire genome, or genetic map, teams from the University of Maryland and the University of Wisconsin-Madison reported Thursday. "We have the pieces all in place. They can't go in any other way. Now we have to understand what the pictures are telling us," said Dr. Stephen B. Liggett, professor of medicine and physiology at the University of Maryland School of Medicine and director of its Cardiopulmonary Genomics Program. The research was published in the online edition of the journal Science on Thursday afternoon. "We generally think of colds as a nuisance, but they can be debilitating in the very young and in older individuals and can trigger asthma attacks at any age," Liggett said. "Also, recent studies indicate that early...infection in children can program their immune system to develop asthma by adolescence." Don't go to work if you're sick -- please! Finding a cure for the common cold has been elusive. That's because the rhinovirus is so complex. Made up of at least 99 different strains, it can infect different people with different symptoms. Visit CNNhealth.com, your connection for better living. By mapping the genome of the common cold and assembling the results into a "family tree," scientists can see how the virus strains are related, as well as their differences. Liggett, who is also the study's senior author, says this is a breakthrough in solving the common cold puzzle because. "At least now we have an understanding of which virus one might have." Now that the pieces are together, drug companies can work on developing new treatments that would either halt or prevent the cold virus before it begins to spread. 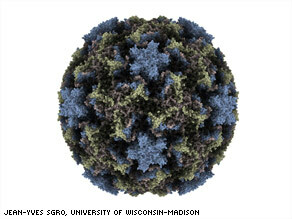 Researchers found that human rhinoviruses are organized into about 15 small groups. So the idea of one drug fits all probably won't work, Liggett says. "Our mindset right now is to consider more along the antiviral treatment, rather than vaccines, but always keep an open mind to the new technology of vaccine development." Investigators are so optimistic with their findings that they predict the development of new drugs within the next two to five years, depending on Food and Drug Administration approval, which could mean one day soon, runny noses caused by colds may be a thing of the past.